You�re viewing our Sausage Maker corned beef cure � 5 lbs. Used to cure corned beef. Directions on package. 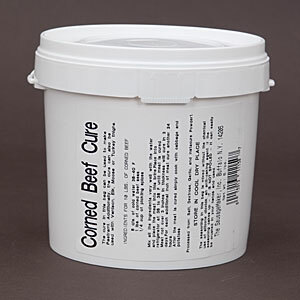 Add the corned beef cure contents into water per the proportion instructions (instructions included) and begin the brining process of your beef. This 5 lb. container cures up to 50 lbs. of beef rump, round, or brisket for corned beef. This cure does not include pickling spice (purchase separately), pickling spice is commonly added to the brine. To learn more about pickling spices, visit Sausage Makers pickling spice products page. Follow the directions on the package to cure meat, 5 lbs. of our product will cure 50 lbs. of meat. Contains 5 lbs. cure per package. Please contact us with any questions you may have about our products. 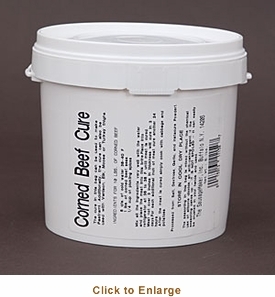 Scroll down to view our Sausage Maker corned beef cure � 5 lbs.